I think the Egyptian government's use of an internet "kill switch" is a prime example of why any government shouldn't have the power to shut down the internet. Keep in mind, there's a bill in the US that they're trying to pass that would give the US a "kill switch" for the internet. In case of a "cyber emergency", whatever that is. Something tells me it's whatever the government would want it to be. I presume you aren't in favor of the bill circulating that would give the US president the kill switch for the internet? @ Looney: That's correct. 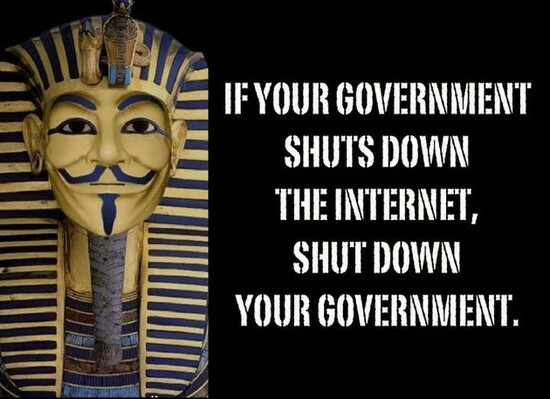 I'm firmly against any bill that gives the government that kind of power over the internet. Now, if there were a bill that would make fast internet a legal right for all, I'd be behind that! Like in Finland.